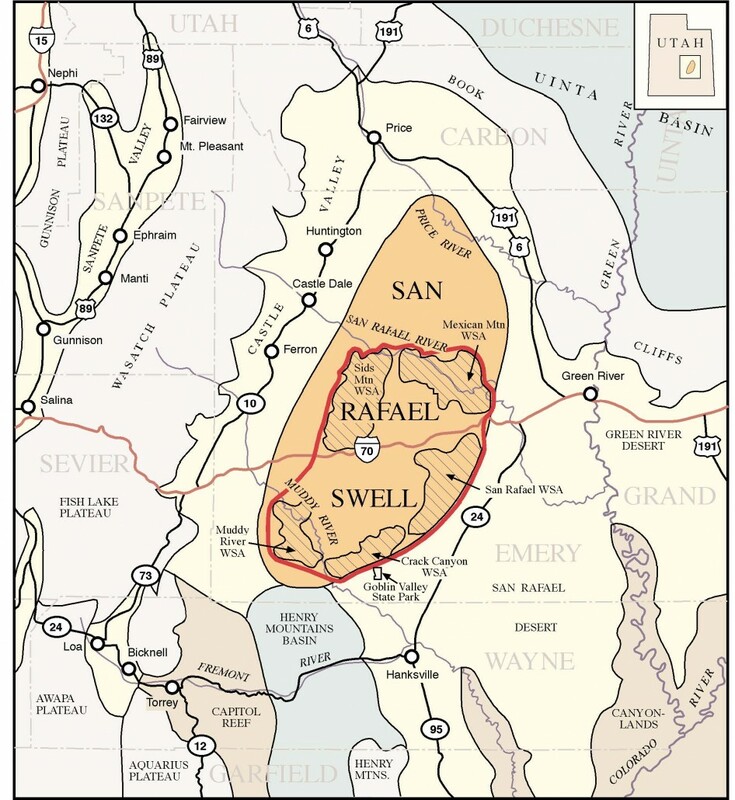 Location of the San Rafael Swell and surrounding physiographic features, existing Wilderness Study Areas (WSAs), and general area of proposed national monument (red outline). Valleys and desert areas are shown in yellow, plateaus and mountains in gray, canyonlands in brown, and basins in green. 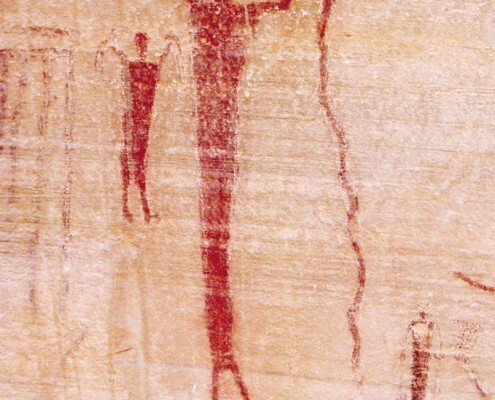 In his January 2002 State of the State address, Governor Leavitt endorsed a preliminary proposal by the Emery County Public Lands Council for the creation of a new national monument in the San Rafael Swell area of east-central Utah. The Swell is an oval geologic feature that covers 1,800 square miles, which equates to about 90 percent of the land area of Delaware. As proposed, the national monument would cover just over half of the Swell area. It would encompass five Wilderness Study Areas presently located in the central and southern parts of the Swell, as well as the Cleveland-Lloyd Dinosaur Quarry in the northern part of the Swell. Historically, the San Rafael Swell has been the site of a variety of recreational activities as well as livestock grazing, uranium mining, and oil and gas exploration. The Swell is also known for its stark and dramatic scenery, which ultimately stems from spectacularly exposed geology. The Swell has been described as a “land of naked rocks” because the sedimentary strata are so colorfully and well exposed. Travel brochures describe the scenery as “great crumbling sandstone palaces and citadels with endless miles of fantastically carved cliffs inciting a drama of upheaval and erosion.” This is a land of overpowering grandeur. 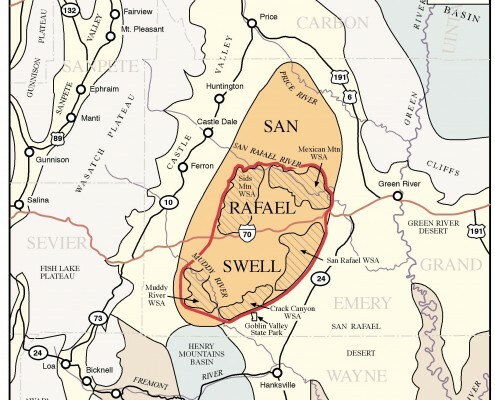 The geologic origin of the San Rafael Swell is tied to compressional tectonic forces responsible for uplift of the Rocky Mountains to the east and Uinta Mountains to the north. 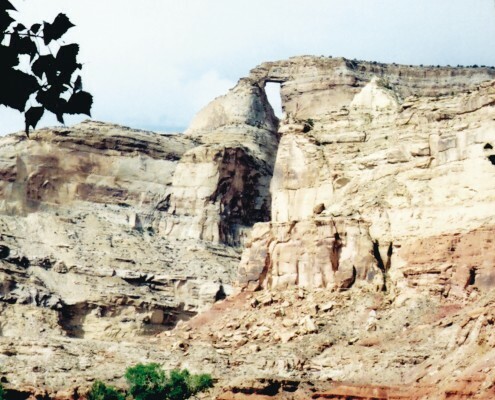 During this mountain-building episode roughly 40 to 70 million years ago, the rocks of the San Rafael Swell were also uplifted as a broad, arch-shaped geologic structure called an asymmetrical anticline. Sedimentary strata in the west limb of the anticline are gently inclined, whereas they are relatively steep in the east limb, forming the San Rafael Reef. The anticlinal structure, as well as the relative resistance to weathering and erosion of the rocks, controls the topographic form of the Swell; hard layers form the steep cliffs and tops of benches, mesas, buttes, and flatirons or hogbacks (tilted surfaces) around the perimeter of the Swell, and intervening softer formations weather into slopes in the interior of the Swell. Streams have eroded into both hard and soft rock layers to form deep terraced canyons, which cut inward into the Swell from all directions. Colorful sedimentary rocks, ranging in age from Permian to Cretaceous, are exposed across the San Rafael Swell. 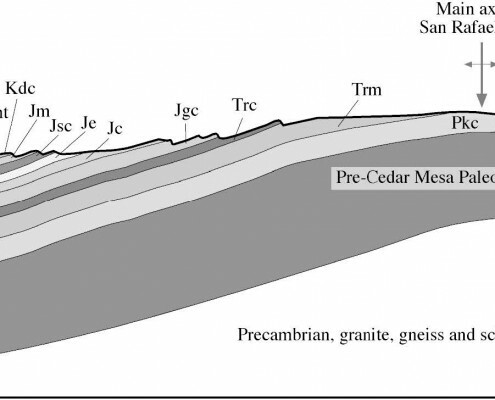 Additionally, Tertiary igneous dikes and sills cut the sedimentary rocks, mostly in the southwest corner of the Swell area. Unconsolidated Quaternary deposits, the weathered and eroded products derived mostly from the sedimentary strata of the area, are ubiquitous in the Swell, especially at the base of slopes and cliffs and along the more active stream courses. Long ago, the San Rafael Swell was a giant oil field as attested by tar sands in the Moenkopi and Chinle Formations and oil-filled cavities in the Kaibab Limestone. Also, many of the porous sandstone and limestone formations of the Swell are bleached, showing the past influence of hydrocarbons. Most of the oil escaped from the rocks when the anticlinal structure was breached by erosion a few million years ago, so the potential to produce commercial quantities of petroleum is low. Small subsidiary structures along the Swell have been targets for oil and gas exploration. Grassy Trail oil field, located on the eastern flank of the Swell, has produced over 620,000 barrels of oil from the Triassic Moenkopi Formation. Carbon-dioxide (CO2) gas was discovered in 1924 in the Jurassic Navajo Sandstone at Farnham Dome on the north-plunging nose of the Swell. Production was 4.76 billion cubic feet of CO2 gas used at a dry ice plant in nearby Wellington, Utah, until 1979. 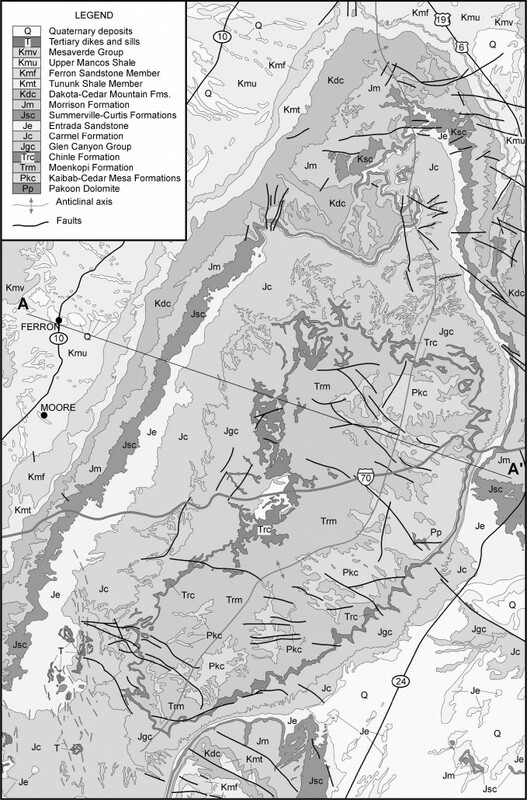 The San Rafael Swell area contains a variety of rock and mineral resources. Presently, only limited commercial production of industrial rocks and minerals occurs at a few locations outside of the proposed national monument. Uranium and vanadium were mined in and around the Swell, mostly during the uranium boom years following World War II. The principal ore hosts include the Moss Back Member of the Chinle Formation and the Salt Wash Member of the Morrison Formation. A small amount of copper may have been produced from the Navajo Sandstone near the center of the Swell. Copper has also been associated with the uranium mines in the Moss Back Member. 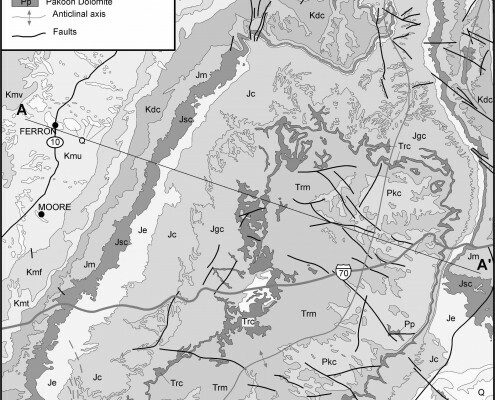 Industrial rocks and minerals include gypsum in the Morrison, Summerville, and Carmel Formations; limestone in the Carmel Formation, Moenkopi Formation, and Kaibab Limestone; and sand and gravel in Quaternary terrace and pediment deposits. The Curtis, Morrison, and Cedar Mountain Formations contain local deposits of agate, jasper, and other forms of collectable chalcedony. Various types of concretions, oyster beds, dinosaur bone, petrified wood, and other items of interest are also present in the area. 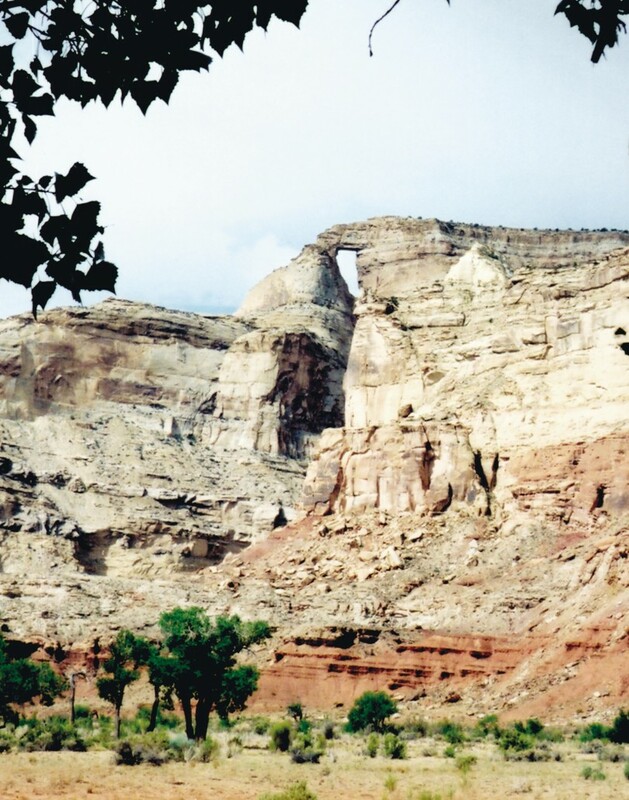 Scenic attractions abound in the San Rafael Swell area. Many narrow canyons cut into the Swell, and are walled by colorful Jurassic and Permian strata including the Glen Canyon Group (Navajo Sandstone, Kayenta Formation, and Wingate Sandstone) and Cedar Mesa Sandstone. Some of the most beautiful areas of the Swell are associated with the colorful Triassic formations that were also the ore hosts for the uranium deposits. Buttes, mesas, overlooks, and other geologic features provide numerous sightseeing destinations. 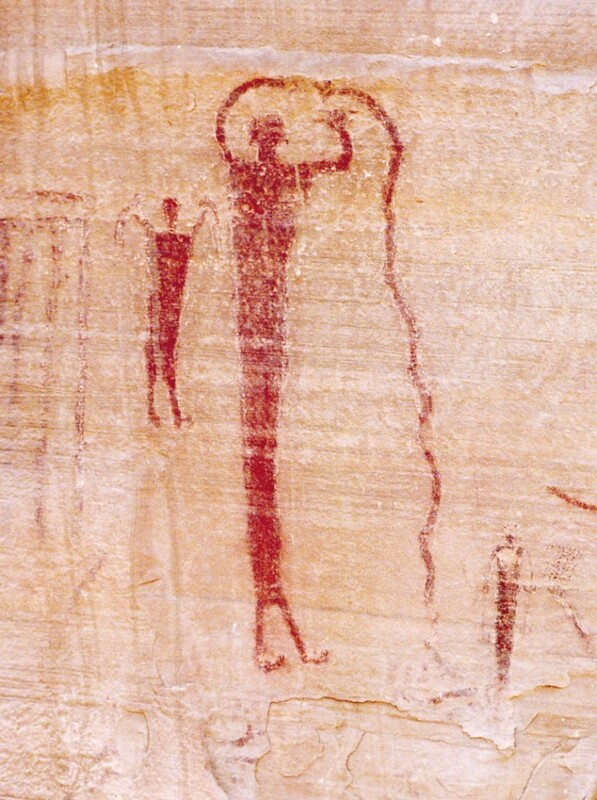 Buckhorn Draw and other localities have excellently preserved Native American petroglyphs and pictographs. Goblin Valley State Park, with its bizarre sandstone hoodoos and goblins, is located along the southeastern flank of the Swell. The Swell is also home to bands of wild horses, mountain sheep and goats, and other wildlife….. The status of the new national monument remains uncertain until the proposal is finalized and a declaration is made by the President. Regardless of the outcome of the national monument proposal, however, the San Rafael Swell will always remain one of Utah’s geologic treasures.